A maglev (or HST) circuit between Toronto, Montreal, New York & Washington? Wouldn't that be a major league game changer to energize and immediately transform the dynamic in our industrial heartland? Demonstrably, the cheapest link doesn't require Canadian participation. 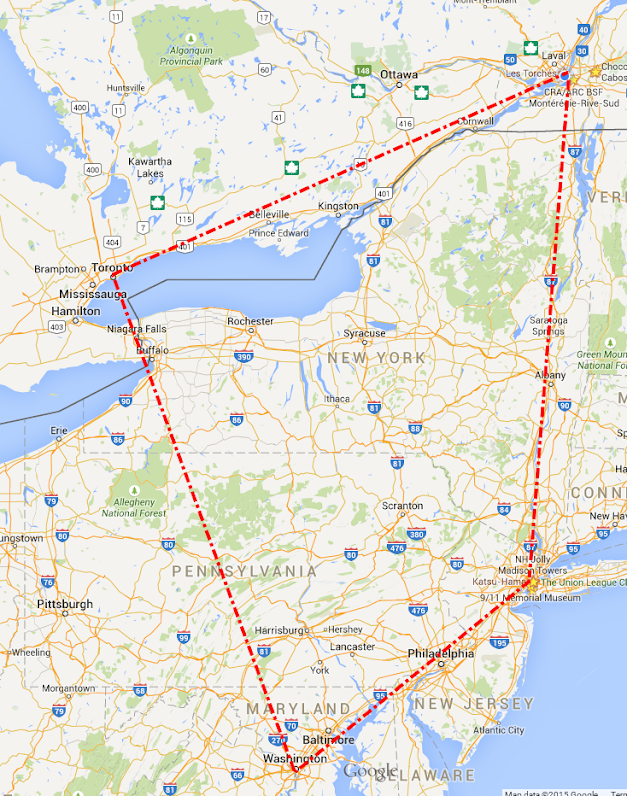 However, there's been a lot of interest to link Montreal with New York and Montreal with Toronto so who knows! I feel if/when an annexation happen, a lot of North/South projects such as this (or keystone) may happen. However, some of these projects could be happening right now on either side of the border (there's nothing stopping a HST to be built connecting Boston/New York/Washington right now, or Toronto/Montreal). I question if an annexation would get these projects off the ground, but maybe it's exactly what needs to happen to get it started! Obviously the links provided were not very realistic, and also aside from Ottawa (the role of Ottawa might be as a backup capital or secondary capital of America?) there is Boston that should be considered as well for inclusion. Perhaps there would be no physical public works project such as these, but the disappearance of the border and all the red tape would hopefully encourage growing trade and ties nonetheless. Alarms whistles going off that this is all "fictional material" talk, unless we somehow develop a new system of sovereign credit that empowers such massive undertakings.. Innovation I guess.. finding a way to make this cheap and easy with boring machines that can really hack through easy.. having one such link (as fantastically unrealistic as it may be) to the arctic region would really empower rapid growth and development of that region and the exploitation of the vast resources it contains! ^ And as a Quebecer I have to say: this transportation system works in any climate and that's a HUGE deal.. North American distances require North American solutions, we'll have to envision something bigger and better to fit our needs and requirements, but the core of the idea remains the same ultimately. To get an idea of the scale of the project, a tunnel from New York to DC would be about 200 miles long. The entire New York City underground currently has about 140 miles of tunnel. Assuming the tunneling itself could be paid for, the volume of material that would be needed for the support-structure in the tunnel would also be prohibitively expensive. Perhaps the tunnel could initially be designed as a sub-sonic line that also services several of the "connecting" cities, such as Baltimore? Another thought I had was you could build the prototype Maglev tunnel in a location and to a curvature where it could be dual-purposed as a launch-assist system. Instead of decelerating a train at the halfway point, you could have a vehicle that accelerates along the entire track, and shoots out through a membrane, which would then power itself the rest of the way to an orbital station. Perhaps connecting two major cities in Texas would be a better place to start, with an 'extender' track on the east side of the more eastern city, so the launch-site for the space vehicles isn't right in the middle of town? Another thing that could be looked at so as to avoid this ever becoming a prestige project as opposed to a sound and useful one, would be to look at the opportunity of designing it primarily as a heavy industrial freight transport grid, with civilian transportation as an afterthought.. the heavy industrial capability would certainly provide the military with a rapid and dependable means of moving assets round for continental defense too! At this point is becomes a public works project that enables increased trade and commerce, the kind of thing that enables massive economic growth and can be a worthwhile investment (worth getting indebted over).